It’s a carnival of fun – grab a barrel and a lute and joke around with the Jester. Taking only half the screen, this mobile slot machine feels small on tablet, and really only works well in landscape mode on smartphone. But boy is it perfect for phones. The graphics are simple enough to be able to play it on 3G only, but with some great funny bonus games and a simple interface, it surprises us to find that we just kept playing this game. We particularly liked the juggling eggs game, which has up to 500x multiplier potentially – although on both times we got this feature, we only got to 25x both times. They managed to make the pick a barrel game a little more fun, by throwing flying chickens, cows and other items to break the barrels. We love the details, the graphics and sounds. One bookmarked for long car and train journeys. Wild Symbol: The jester is wild and substitutes all symbols except juggling balls, baskets and barrels. Jester Wild Feature: This feature will appear at random after any spin. The jester will jump around the reels making random symbols wild. You then get additional wins based on the new wilds. This can include getting Juggle and Barrel bonus features activated. Juggle Bonus: If you get egg baskets on reels 1, 2 and 3 a bonus game pops up, where the Jester is juggling three eggs. You then progressively start adding eggs which increases the multipliers from 2, 3, 4, 10, 20, 25, 50, 100, 250, 500. You can go past certain points (10 and 50) which are safety levels. Meaning if the juggler drops an egg at any of those points, you go back to the safety level and win that amount. Golden eggs will help you skip levels and get higher up the chain. At any point you can ‘collect now’. Barrel Bonus: A simple pick and choose barrel bonus feature game is made a little more fun as each of the barrels are destroyed in curious and funny ways. Even though there are no free spins, the bonus features are fun, inventive and pay out well. 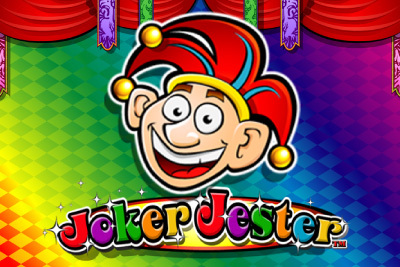 Joker Jester is a mobile slot perfect for mobile/cell phones and long journeys.